Graze for an average of seven hours a day. Like to eat grass, clover, forbs (a broad leaf, flowering plant), and other pasture plants . When fresh forage is not available, they are usually fed stored or harvested feeds, such as hay, silage and grains. Live in fields and barns on agricultural farms. Do not like to walk in water or to move through narrow openings ... and they don't like shadows or harsh contrasts between light and dark. Shepherds use dogs to move sheep, because the sheep consider a dog as a predator. They will, therefore, flock together for protection and move away from the danger. 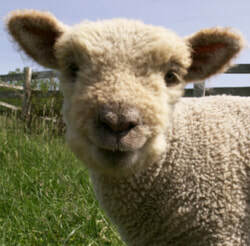 Can see in colour with a field of vision of 270 degrees (which might be affected by the amount of wool on the face). If a sheep finds itself on its back, then it will need to be helped because they cannot get up from that position. Are known to self-medicate by eating specific plants when they are ill, in order to cure themselves. Hold their tails downward, whilst goats hold their up. Can survive for up to two weeks buried in a snow drift. Black sheep have a better sense of smell. Can see behind themselves without moving their heads. Herds of sheep moved at night must have a white light at the front and a red light at the rear. ​Sheep are herd animals and stick together to reduce the threat from predators. It makes sense for them all to graze in the same direction, so the herd stays together as it drifts around the field or across the savannah. Facing the same way also cuts down on conflict in the herd because it avoids head-to-head confrontations. A herd of cattle and a flock of sheep grazing together in the same field is known as a 'flerd'.